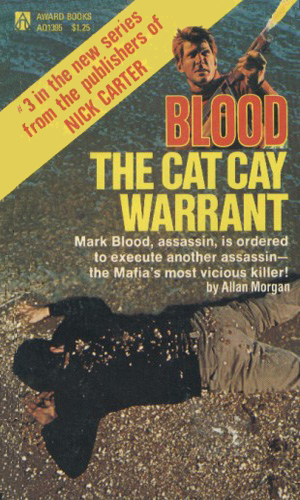 Mark Blood is an assassin for the CIA. He was, prior to the commencement of the chronicled events, a Captain in the Marine Corps serving in Vietnam. He had received numerous medals and decorations and had been much written about for his heroism. He was considered one of the very best the military had for infiltration and elimination. Nevertheless, he was disliked by his immediate superior for being the kind of soldier that man knew he never could be and that held the prospect of promotion for Blood unlikely. As the series begins, Blood is reeling from the new of the murder of his wife during a plane hijacking. They had met and married during a two-month break from Vietnam that Blood had earned and during those two months they were inseparable. She had a "girl-Friday" job in Washington and he was a decorated hero but mainly they seemed to fit so perfectly together. While Blood was large and strong, she was small and soft. When he returned to Vietnam, she was in his mind constantly. When his jerk of a boss told him in a nonchalant manner after a mission in which Blood had been wounded, "Oh, by the way, your wife is dead" Blood lost control. Luck and two soldiers kept Blood from killing the man. This launches Blood's personal mission to learn the truth and to punish the offenders. An offer by the CIA for employment was ignored as he was intent on justice for his spouse. Eventually, after he had taken care of the people who killer her, he reconsidered the offer and became an agent. Trained in numerous ways to kill, Blood is able to dispatch an enemy with a gun, knife, or just his bare hands. Wishing to avenge the murder of his wife during a hijacking to Cuba, Blood is approached by the CIA to help evacuate from Cuba the wife of one of Castro's chief aides as a way to get back at the one who ordered his wife's death. An old friend from the Vietnam War, at the suggest of the CIA, contracts with Blood to ferret out an assassin targeting a major peace conference. 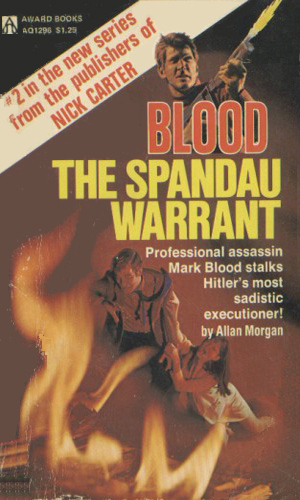 The only one who can identify the killer, however, is a Soviet guard in Spandau Prison from which Blood must smuggle him. The FBI and Scotland Yard have combined to hire Mark Blood to help topple a scheme by a Mafia don who is using a theft of a million pounds to bankroll a takeover of the underworld in the US. 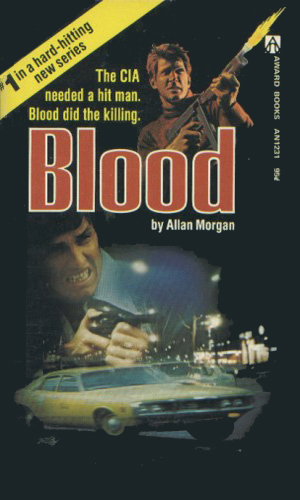 The three-book series about Mark Blood is a light, undemanding but still enjoyable set of stories, very much in the movie-of-the-week mode. They don't ask much of the reader and they give a certain amount of pleasure. The character is the best part of the series as Mark Blood, despite the label of a perfect killing machine, is extremely human and believable. He is the kind of man you'd like to go bowling with, especially if the bowling alley is in a seedy part of town. There is little espionage in these stories. Just a lot of shooting, fighting, and eliminating bad guys.